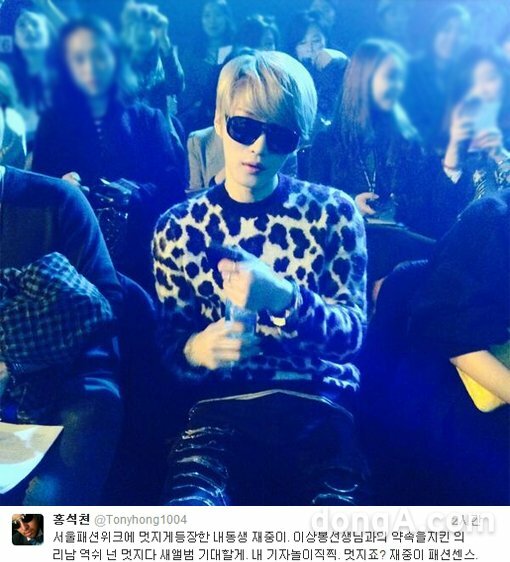 Hong Seok Chun recently showed off his friendship with JYJ’s Kim Jaejoong. The photo in question was taken during the ‘2014 S/S Seoul Fashion Week’ show that was held on the 21st at Yeoido Park to showcase Lee Sang Bong’s latest collection. Kim Jaejoong can be seen opening a bottle of water with his sunglasses on. Meanwhile, Kim Jaejoong’s agency revealed today that the title song of his first full-length solo album ‘WWW: Who, When, Why’ will be ‘Just Another Girl’, which will feature lyrics written by the singer himself. His album will be released on the 29th of October.